It is announced that the expedition to Ta Island, Satawan Atoll, Mortlock Islands, IOTA OC-254, Federated states of Micronesia, by the members of the Nara DX Association, Japan, is going to go on the air tomorrow, Thursday, July 19. According to the directory of the IOTA by RSGB, OC-254 consists of four islands, namely Etal, Lukunor, Satawan [aka Ta] and Namoluk. These islands are actually atolls and the largest Satawan Atoll is a ring formed by several small islands. As I wrote in an article one year ago, I have a history book compiled by the veterans of Imperial Japanese Army and Navy, stationed at Mortlock Island during WWII. Mortlock Island is on the right page. Chuuk Islands are at the center, at the border of two pages. 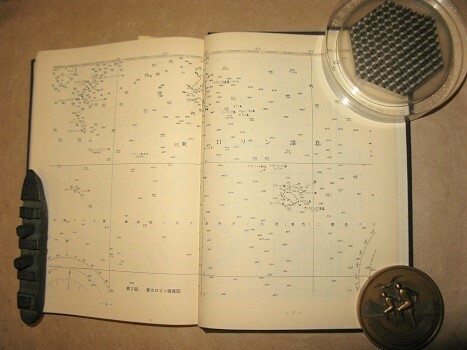 The book has larger maps of Satawan Atoll, and Satawan Island at the south-eastern corner is separated by a narrow channel from Ta Island to the west. I do not know where the radio station will be set, but the island at the south-eastern corner is likely to be the site as it is wider and appears to contain more houses and buildings than other islands. The IJA unit stationed to defend Mortlock Islands was the Fourth Battalion of Nanyo (Southern Ocean) formed at Matsue, Shimane, in 1943. Because of the leap frog strategy of the Allied Forces, they saw only air raids and bombardments by fleets, although they had to fight with hunger forced by the naval and air blockades. The book contain an article by the flyingboat pilot of the IJN, who alighted there at midnight after an aborted mission to Rabaul, New Britain Islands. The second attempt to Rabaul by the crew next day was successful, helped by refueling at the island.